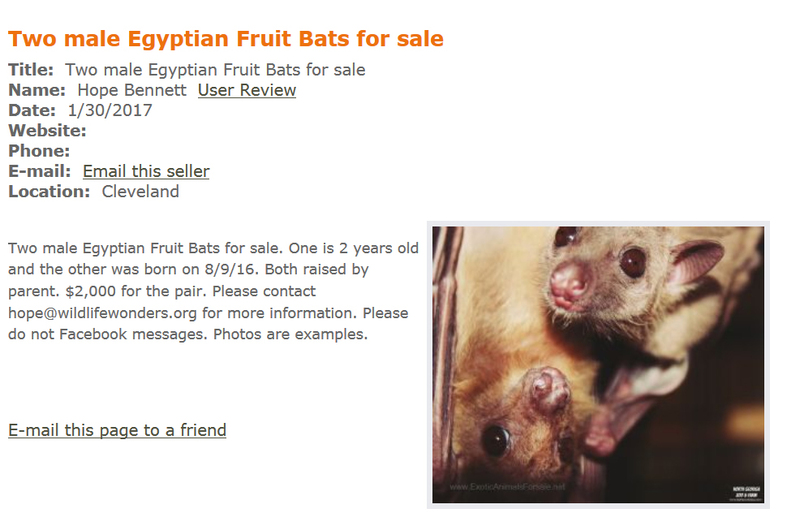 So why then, is Wildlife Wonders selling fruit bats into the cruel, exotic pet trade, knowing that these animal are doomed to a miserable existence and certain death? Could it be that the almighty dollar was more important than the lives of these innocent animals? This is one of the ads Wildlife Wonders has placed on the internet. What happened to “… a sense of RESPECT. …to ensure that these animals have positive futures.” ??? Of course, the Wildlife Wonders ad does not contain the fact that the high price paid for these bats will be wasted when the bats die, likely within the very first year. Shame on you, Wildlife Wonders. These innocent animals deserve better.